When people ask me what I do, it’s an easy answer: I run a charity with my wife, called New Perspective Foundation (NPF) that provides financial assistance for the travel expenses incurred by family and friends of individuals hospitalized due to a spinal cord injury. In many cases, after someone suffers a spinal cord injury, their loved ones travel long distances, quit their jobs, and/or go into debt, just to ensure they can be at their bedside. We feel there are enough things to worry about after someone suffers a spinal cord injury, and whether or not you have enough money to travel to be with them should not be one of those things. However, when people ask me how I came to start a nonprofit that focuses on spinal cord injuries, the answer is a little more complicated. Growing up in Ohio, I was raised as an Ohio State Buckeye fan from day one. It was always my dream to play football for the Buckeyes, and in 2004, after years of hard work, my dream came true. In the spring of my sophomore year, we had a team scrimmage and during one play in particular, I caught a ball going over the middle of the field and my teammate made a routine tackle. Except, after that play, I didn’t get up. I couldn’t get up. I had broken my neck and suffered a C4 spinal cord injury. In an instant, my world turned upside down. I went from living my dream and being in fit, physical condition, to being trapped in a nightmare — having to rely on someone to scratch my face, feed me, and help me go to the bathroom. Over the next several months, I did rigorous physical and occupational therapy. Throughout the whole ordeal, my family was by my side lifting my spirits and encouraging me when my circumstances felt overwhelming. The national prominence of Ohio State football meant that many people had heard about my injury and sent me hundreds of get well cards. Some of those included gas cards to help my parents with the four-hour, round-trip drive they made multiple times a week so they could be with me. Those gestures of kindness from total strangers always stuck with me. I don’t know what I would have done if my parents couldn’t manage the additional expenses that came with my injury. The question I get asked most often is, “If you could go back and do things differently, would you still do everything the same?” The truth is, I wouldn’t change a thing. There is no doubt, nothing about quadriplegia is fun, but there have been so many blessings that have come from my injury, I couldn’t see myself wanting a different life. If I hadn’t broken my neck, I wouldn’t have met my wife, had my son, started NPF, or met countless wonderful people along the way. One of those people is Brett Heising. Not only do we both have a physical disability and a passion for helping others with disabilities, but more importantly, we are both diehard OSU alumni. I love that he has decided to take everything he has learned from his physical challenges and created a platform that helps people with disabilities travel confidently by providing the accessibility-focused information we need. I am honored to partner with brettapproved.com. There’s a world out there that needs exploring. No matter where you live on the spectrum of physical ability, like Brett, I believe that travel is for everyone and I can’t think of a better way to gain a new perspective. For more information about New Perspective Foundation and to find out how you can help, email Tyson at [email protected]. A proud son of Sandusky, Ohio, Tyson graduated from The Ohio State University with a Bachelor of Arts in Speech and Hearing Science and went on to earn his Master’s in Rehabilitation Counseling. Today, together with his wife Megan, their son Adam and dog, Hayes, he calls Seminole, Florida home. When they’re not running their nonprofit Tyson and Meg enjoy being on the water, going for walks, and Ohio State football. 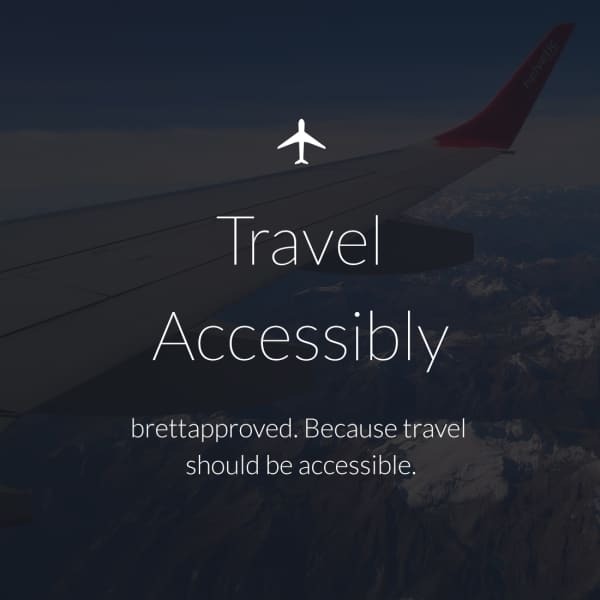 Previous story brettapproved and ACA want you to travel confidently!